Bruno Senna Lalli (Portuguese pronunciation: [ˈbrunu ˈsenɐ], born 15 October 1983) is a Brazilian professional racing driver currently racing for Rebellion Racing in the FIA World Endurance Championship. He is the nephew of the late Ayrton Senna, three-time Formula One world champion. Bruno Senna raced in Formula One from 2010–12. 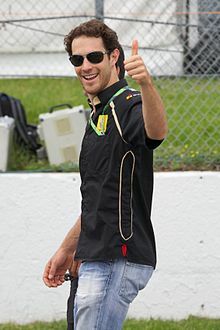 He made his debut driving for Hispania Racing in 2010, raced for Renault from August 2011 as a replacement for Nick Heidfeld, and drove for the Williams team in 2012. Between 2014–16, he drove for Mahindra Racing in Formula E. His mother is Ayrton's older sister, Viviane. I always want to be racing. A race driver needs to be quick, to be intelligent, to have good relationships and be in the right place at the right time. There are a lot of factors that would create a successful race driver. I am very proud to be Brazilian and more motivated than ever to demonstrate what I can do.